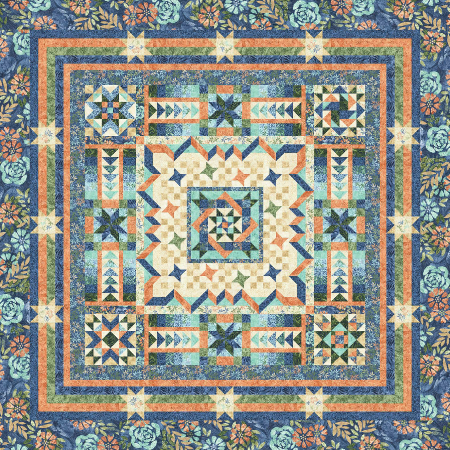 Tranquility BOM Quilt - Queen or King - Includes Backing! Programs - Most Include Backing! 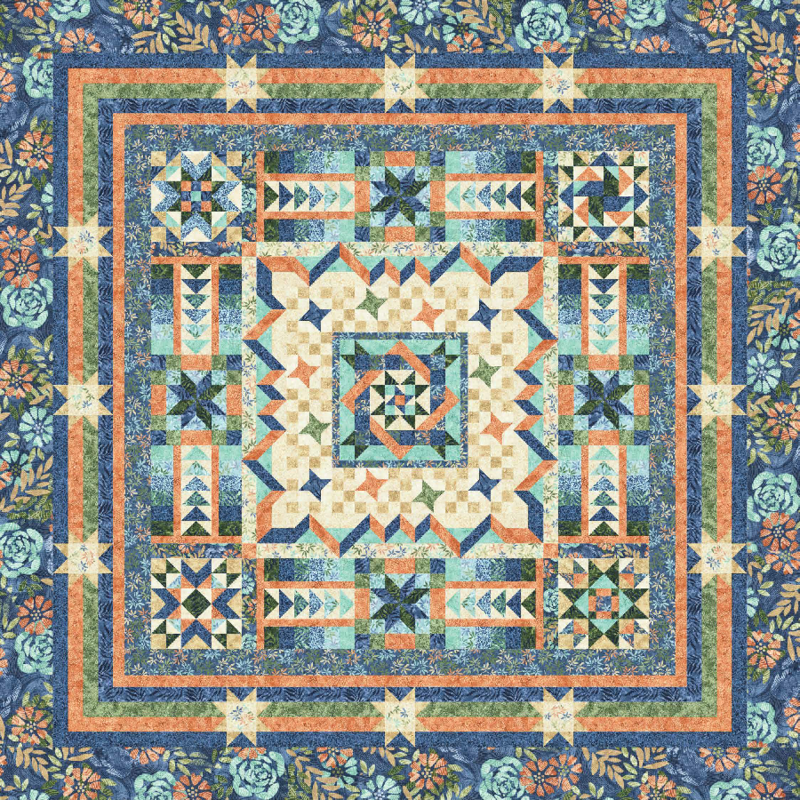 > Tranquility BOM Quilt - Queen or King - Includes Backing! 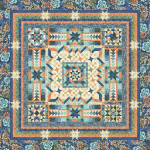 Finished Size - Large Queen - 106" x 106"
Note: Fabric for Tranquility will soon be discontinued. We may be able to cut another 6 kits of various sizes. We have a few Queen size in stock now. The King size has larger borders - 10" instead of 7", more binding and backing, etc. Although we are "officially" out of the King size, we may be able to reconfigure a Queen into a King. Call us at 785-243-4044 if you want this larger size. This project includes the pattern, a Boo-Boo bundle, and all fabrics for the top, including coordinating backing and binding. After you place your reservation fee, we will call you to go over the details of your program. We cut entire kits in advance, which means we are very flexible in how you want your program to work. Choose 1, 2, 3, blocks per month or even the entire kit! Please note that if you choose the Complete Kit option, you will receive the kit cut as a BOM project. We mention this because some stores just cut hunks of fabric. 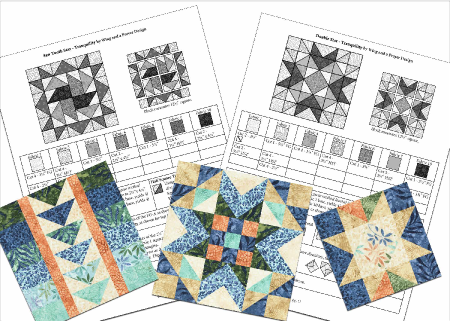 With Fabric Essentials, you will receive all the goodies you have come to expect with our programs - a Boo-Boo Bundle of extra fabric, exclusive cutting diagrams, backing and binding! P.S. We just found out that many stores do not include binding in their BOM programs. It pays to ask questions so you know exactly what you are getting! 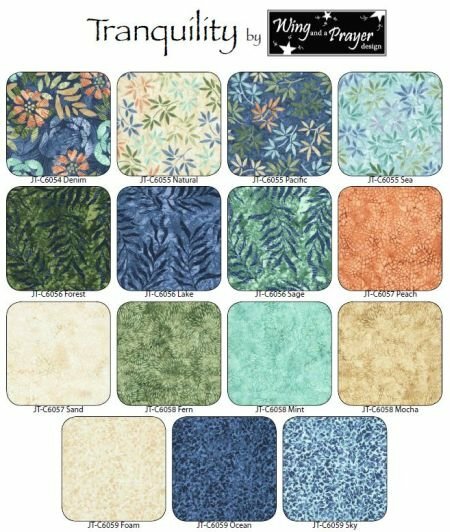 Tranquility - A printed cotton collection with an essence of batik! 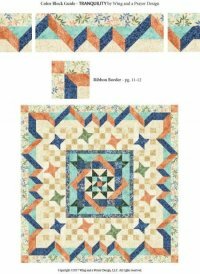 * Pattern with Full-Color fabric guide! * Over 17 yards in the top alone! 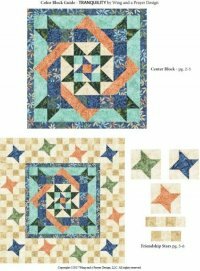 * Coordinating 45" backing - cut into three equal pieces! 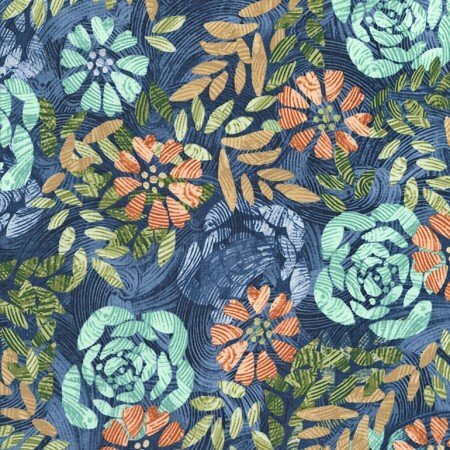 Outer Border Fabric - NO seams in this beautiful fabric! The pattern calls for cutting WOF strips, which will result in seams in our outer border. We have a NO SEAM IN OUTER BORDER policy. We supply a long piece of fabric and your borders will be cut in LOF (length of fabric) strips. No seams in your outer borders! 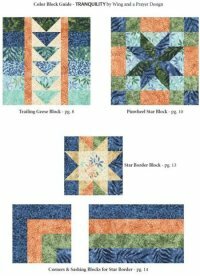 Blocks range from 8" to 18"
Month 1 - Block Assembly - You will receive your Boo-Boo bundle of Fat 8ths, and your first package of fabrics and patterns to make multiple blocks. Month 13 - Backing - You will receive your coordinating backing (this kit has been paid for with your reservation fee! 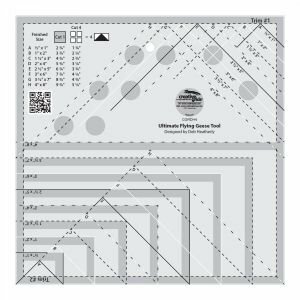 According to the designers, "We used the Creative Grids Ultimate Flying Geese Ruler and liked the no-slip feature it provides when squaring up geese. 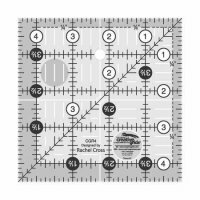 We also found the Creative Grids 4 1/2 " square ruler helpful for squaring up block components". Click on the rulers below to order. 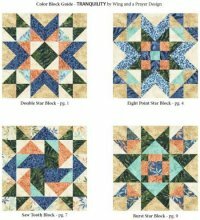 I received my last month of Aunt Grace Simpler Sampler and busy putting the blocks together. I love the diagrams and which direction each seam should go. I am almost finished putting all the sections together and then I will start on the extension kit as I am making a king. 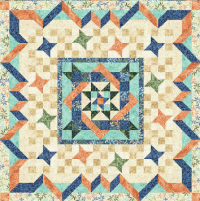 I will be hand quilting this. Thank you so much Marsha Doyenne for the thank you card. I have done many BOMs over the years and this was a first for me. This has been the best BOM I have ever worked on and I will be ordering again in October. I have really enjoyed this. Thank you so much.